Move cursor over sketch to see labels. 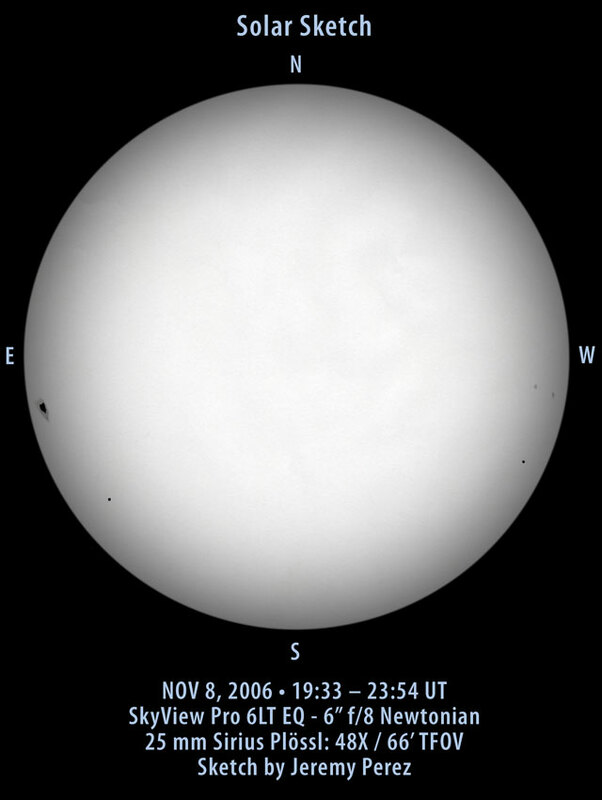 On Wednesday, November 8th, 2006, Mercury was due for a solar transit. Now, in my neck of the woods, that just happens to be a work day. So I planned to set up the scope during lunch in the parking lot, or outside the lunchroom. The only thing I needed was a solar filter. A couple years ago, a very kind and generous amateur astronomer from Phoenix, Scott Kroeppler, sent me a couple small Baader solar film samples. Other than some casual, unmagnified looks at the sun, I hadn’t put them to good use. Until now. I stayed up the night before, rigging these two 1-inch square pieces of solar film and a sewing hoop to an 8 inch square piece of foam core. I wasn’t sure if it would work, but the next morning, I pulled into the parking lot at work, put my mangy, home-made solar cap on the front, and got a handheld look at the sun for the first time through my own scope. Not only did it work great, but I was pleasantly surprised to see a huge sun spot easing over the solar limb. So I got to work, and then about 15 minutes before the beginning of the transit, I put it all together on the patio outside the lunch room where I had the best opening between all the trees. I didn’t start quite early enough, because by the time I got everything set up and the solar cap taped on securely, Mercury was already well inside the solar disc. 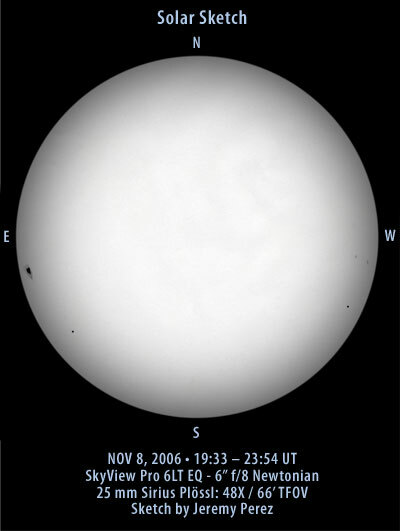 It looked just like a printed period against blue-white filtered circle of the sun. It had entered just south of the massive sunspot I noticed earlier. A couple fainter sunspots rested on the opposite side. At that point, I made my first solar sketch, and noted how easy it would be to really exaggerate distances and proportions across the sun’s face. I was excited to see that light, textured, filamentary features were visible around the sunspots. As I studied these features, I noticed that it didn’t take long for Mercury’s motion to become apparent. Over the next 45 minutes, I invited passing coworkers to have a look. They all seemed happy to get a look at the transit, particularly after reading about it in the newspaper the day before. As folks walked up to the eyepiece, I tried to coach them a bit with the sketch to be sure they didn’t confuse the sunspot for Mercury. Quite a few commented on how very tiny the little planet appeared. Several of them were even able to make out the two relatively faint sunspots over on the western limb as well. After a little more than an hour, I moved the scope to an out-of-the-way spot, and went back to work. At about 20 minutes before the end of the transit, I raced outside to find that the sun was completely hidden behind trees where I had the scope set up. With a bit of scouting, I moved the whole thing into the parking lot about a hundred yards to the north where I had a clear vantage. And here I got to watch that perfect little dot edge closer to the western edge of the sun. At about four Mercury diameters from the edge, the whole shebang began to sink behind a tree-lined ridge a mile to the west. So I missed seeing Mercury merge with and disappear into the darkness on the other side of the sun. It was still a fascinating event to witness, and since Mercury won’t do this again until 2016, I’m glad I was able to fit it in. The sketch at the top of this post was overlayed onto a digitally generated disc with limb darkening that estimates what I saw through the eyepiece. The next time I sketch the sun this way, I’m sure I’ll want to include the lighter features, which will mean generating that limb darkening manually and erasing through it. Wonderful report and great sketch. Like you I set up a telescope (4.25″) to show coworkers and passing students this transit of Mercury and I also used a Baader filter. Your drawing is a perfect representation of the event we witnessed. Frank, thanks! It’s great sharing the view with people would otherwise have missed it, isn’t it? I’m glad I took the time for a sketch–the photos I took turned out horribly! It’s a splendid appearance! My hat goes off. I feel like looking in your eyepiece.